Industry 4.0 / Internet of Things (IoT) means that Customer journeys are forever changing. How do you keep up? That’s easy you let us do the hours of research then we sift through and share the best and most relevant information with you to enable you to grow your brand and stay one step ahead of your competitors. We have recently designed this brochure style impact report for Coastal West Sussex Mind. In previous years, the impact report was A4 size, however, this year we decided to change it to A5 to make it easier for people to keep. Government cuts has also put pressure on charity marketing budgets, so the A5 16pp A5 is far more economical than A4. And of course it is more planet friendly. In this blog, our Chartered Marketer, Vicky Vaughan, asks the question: Is it better for small businesses to look larger than they are? Or like Heck Sausages, should small businesses promote themselves as a small, family run business? The Brand Surgery® is now an official government growth voucher scheme service provider for marketing consultancy. This means that you can get £2000 towards an offline or online marketing, branding or marketing communications strategy developed by our in-house chartered marketing consultant. The Brand Surgery® enjoyed a fabulous, sunny and incredibly blustery, Sunday afternoon at Chippingdale Cricket Club. The Brand Surgery® has sponsored Chippingdale Cricket Club’ Twenty10ty league this year. The Brand Surgery® is an ethical design and marketing agency and as part of our Corporate Social Responsibility (CSR) strategy, we volunteer our time and selected services for a number of charities and communities in and around Worthing including Durrington High School and Go Youth Activities. Are you an experienced kitchen fitter? Are you self-employed and looking to work with the UK’s fastest growing and best provider of kitchen solutions into the contract market? Paula Rosa Manhattan has been established for over 60 years. We are proud of our accreditations including our Royal Warrant which demonstrates our commitment to providing the highest level of quality in products and service. The course has been created for business owners, people looking at setting up a business and for those who are considering a career in the exciting world of marketing. The 10 week course is run by Vicky Vaughan, DipM MCIM, a Chartered Marketer who has run an award-winning creative design and marketing agency for eleven years. Vicky has 24 years of combined design and marketing expertise which is a powerful combination. We created the concept for these bus livery graphics which you may have seen on a road near you recently! Our brief was to refresh the Pulse bus rears, while matching the existing Pulse branding on the sides of the buses. For this project we applied our Chartered Marketer expertise and focused on the benefits of bus travel over driving. Online freedom of expression benefits: The Defamation Act 2013 is good news for website owners because from now, you are not liable for defamatory remarks posted by external users, or where the author of the defamatory remark is sufficiently identifiable, or the website complies enables the complainant to make contact with the author. So does this mean you will allow comments on your blog from now on? Prankvertising is when a brand uses a prank for its marketing on unsuspecting consumers: the trend seems to be to scare and shock people – social media is prankvertising’s best friend. Do you think it is marketing gone one step too far or do you think it is a good idea? The Advertising Standards Authority (ASA) advertising codes state that ads must not cause fear or distress without justifiable reason; if it can be justified, the fear or distress should not be excessive and marketers must not use a shocking claim or image merely to attract attention. Personally, we think the LG prankvert above is unethical given the constant threat of terrorist activities. We think the new website looks much punchier and modern, and is still easy to navigate. If your business is on a tight budget, then a website refresher is ideal because you don’t have to pay for more copywriting. If you’ve invested heavily in SEO, we can simply update the website design so your page rankings are not affected. And if you have tried-and-tested website functionality you don’t want to lose, a website refresh will help you achieve this. Jonny Benjamin tried to take his own life six years ago by attempting to jump off the edge of London’s Waterloo Bridge after having been diagnosed with schizoaffective disorder. Luckily a stranger talked him out of it. Six years later Jonny, in a better place, felt compelled to find the stranger and thank him for saving his life. So Jonny launched his story via social media with the help of Rethink Mental Illness. #FindMike trended on Twitter in UK, Canada, South Africa and Australia. Eventually Neil Laybourn aka #FindMike, came forward after his girlfriend had recognised the appeal on Facebook. Jonny and Neil met and described the meeting as ‘incredible’ and are hoping to keep in touch. You can hear this amazing story in full by clicking here. We are currently working on the Praxis website copy and design and look forward to showing you these in due course. If you would like a logo for your business, give The Brand Surgery, No 1 Design and Marketing Agency in Sussex on 01903 824229. Happy Christmas! We’ve been working hard training on Prezi, new presentation software. It’s amazing. Take a look at this example – you will be prompted to download the FREE Prezi app before you can see it. If you don’t have time to download Prezie – we’ve shared it on YouTube and you can see it by clicking here. The Brand Surgery is qualified to train businesses in the strategic use of CSR strategies. Our CSR strategies have been proven to improve your corporate reputation and competitive advantage which in turn will grow your business. This short presentation has been designed by The Brand Surgery, branding agency in West Sussex. If you would like a Prezi presentation like this, call Vicky on 01903 824229 or email vicky@thebrandsurgery.co.uk. FACT 1: Managing your corporate reputation increases your competitive advantage because if your business is pitching for project and your fees are the same or close to your competitor, the business with the best reputation will win. We have just returned from the Coronation Festival which took place in the gardens of Buckingham Palace 11th-14th July 2013. The event was a corporate hospitality day and also the launchpad for our new Planet2050® kitchen specification which was extremely well received by all who attended. We have been working with ICTR for a few months now and have recently finished the logo design part of the rebrand. We are currently working on the new website which will be launched in July 2013. We are particularly pleased to be working with a business that shares the same ethics as our own – mainly sustainability. Steve Coates, CEO of ICTR was recently awarded Entrepreneur of the Year at the Government’s Improvement and Efficiency awards in Westminster, for his innovative ideas to help companies dispose of IT assets in the most responsible and safest way. Steve introduced The Brand Surgery to the concept of The Circular Economy. Energy management is an emerging theme that has an enormous impact upon the UK house construction industry (HCI). The HCI is required reduce its carbon emissions by 77% before 2050 (The Green Construction Board). Manhattan Furniture is a high achiever in environmental matters, having been accredited ISO14001 which means that the business is continually improving its environmental targets. We created Planet2050® to help Manhattan Furniture’s clients within the HCI to meet these targets. Vicky Vaughan is co-ordinating the Coronation Festival event for Manhattan Furniture and the project includes stand design which incorporates the new Planet2050 kitchen design, corporate hospitality for 200 guests, staffing rota for stand/kitchen installation and exhibitor staff, Buckingham Palace security accreditation for all staff, security and logistics, marketing communications, PR, hotel booking, copy writing and stand graphics. Five excellent marketing and business book recommendations to boost your bottom line. Due to diversification of our services, we have been busy rebranding The Brand Surgery® and we are pleased to announce the launch our our new logo and website. Our new-look reflects our carbon neutral and chartered marketer success and our creative and marketing services. Ding Dong Merrily on High! We’ve listened to you and we have created some fantastic offers to get your business on-track for Christmas from as little as £99. OFFER 1: Convert your website to CMS so you can make your own amendments from £450, OFFER 2: Website makeover from £150, OFFER 3: Strategic website health check from £99. Call Vicky on 01903 824229. 1 in 4 people will experience a mental health problem this year; for Worthing alone this is 25,000 people. If you or someone close to you has been affected by mental health problems, join us for this fantastic event organised by Worthing and Arun Mind, to show your solidarity. This year, Worthing Idol has come back in disguise! For one year only, Vintage Idol is taking place, which is an over-55 Talent Contest. On Sunday 28th October at 2pm in the Empress Suite, Connaught Leisure, Marine Parade in Worthing, 20 nervous, mature contestants will be waiting to entertain you while being judged by Worthing’s very own Terry Winstanley, Tim Loughton MP, Iain Flitcroft and last year’s Worthing Idol winner – Lizzie Haynes (who will also be performing). Dave Hunt is compering the event. Well at long last. All the studying was worth it. Long days and nights with my head stuck in the thickest marketing books you could imagine. I am so excited about this certificate, because it means that The Brand Surgery is one of the only design agencies in the area with this status. It means we are up-to-date and degree-level educated with the most relevant of marketing expertise. Recently, I have been working closely with a local manufacturer looking at the company’s key accounts. The first thing to remember about key accounts is that you need to know as much as your client’s business as you do about yourself. One of the reasons I have loved my ten years in business, is because my role is varied. We may be experts in award-winning logo design, however, in order to be experts, we have to learn about our clients. So no two days is the same. One day we are learning about kitchen manufacturing, the next- garden design, the next – the travel industry. We have to keep up-to-date with the latest news which affects our customers, as what affects them, affects our business. Meet Nick. Our newest web developer. Nick joined our branding agency a few weeks ago. Nick lives in Worthing, and when he is not working, he loves Hiking, Photography and developing iPhone Apps. Claire was awarded an OBE for services to Jazz Music by HRH Prince Charles at Buckingham Palace in December 2011. She has worked with with Noel Gallagher, Paul McCartney and John Martyn and is the only European singer to have reached Number One for two weeks in the Gavin Jazz Charts with her fifth album, Make This City Ours. Who do you send your e-campaigns to? If you send one e-shot to all your customers and potential customers then do not be surprised if you don’t get a healthy response. If you are sending a campaign to existing customers, then write something to appeal to them. Make them feel special and reward their loyalty with a tailored email and not a mass marketing email. If you are approaching a customer base that you haven’t worked with before then find out about them so you can tailor your emails next time around. The Brand Surgery were recently asked to create a new concept to help increase ticket sales of Megarider bus tickets in the Stagecoach South area. At The Brand Surgery, we like to practice what we preach, and we have been saying for several months now, how important it is to ensure that your website is easy to use and navigate on different devices, cross-platform and cross-browser. That’s why, we have been working away producing a ‘mobile-friendly’ version of our website, for mobile phone users. 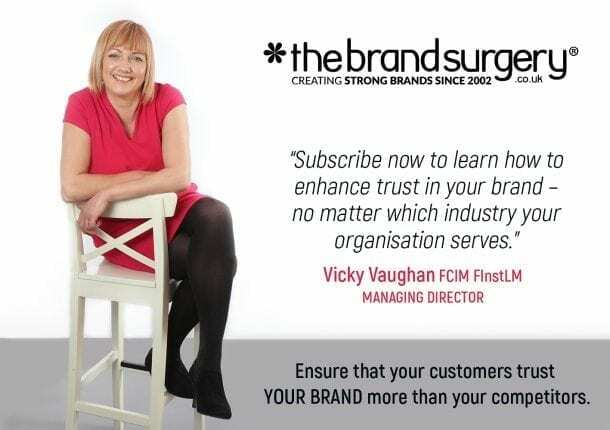 Vicky Vaughan, MD of The Brand Surgery gains another CIM qualification – Developing Customer Value. It has, however, been demonstrated that SMEs have so far put little emphasis on branding (Inskip, 2004; Gabrielsson, 2005; Ojasalo et al., 2008). If you are an SME, or you know of an SME that doesn’t want to get left behind because of lack of understanding in the subject of branding and marketing, Vicky is offering a two-hour 1-2-1 marketing strategy consultation for £170 (ex VAT), or 2-2-2- (£245 ex VAT) in the comfort of your own offices. She will relate the importance of branding to your own business and give you a prescription to follow to get you on the right track. Call Vicky on 01903 824229 or email to register your interest. A message to all of you at Olympics head office. Please get off your high horse – you are not more important than the Queen’s Diamond Jubille and you should take a leaf out from the Official Diamond Jubilee organiser’s book and share your ‘symbols’ so everyone can promote this amazing event! We appreciate that your sponsors pay £millions to use the dreadful 2012 olympics logo – we don’t particularly want ‘that’ logo. However, how did the five interlocking rings symbol created by Pierre De Coubertin in 1914 come to be copyrighted by the International Olympic Committee? The five interlocking rings have a meaning: “These five rings represent the five parts of the world which now are won over to Olympism and willing to accept healthy competition.” (from Wikipedia so must be true!). Perhaps the Olympics Committee is concerned about a little healthy competition from community events because they will probably attract more attendees – espeially after all the difficulty in purchasing olympics tickets! We instantly suggested a Content Management System to sit beneath their new website to allow them complete control of the copywriting of the website as well as access to numerous dynamically created sections such as ‘News’, ‘Projects’ and ‘Enterprise Activities’ the latter of which can be submitted by website users via a unique and sophisticated form on the website. We read and analyse the latest research and then sift the most relevant parts to enable you to grow trust in your brand.